"If the death penalty is reintroduced in Turkey, that would lead to the end of negotiations," he told Sunday's edition of Germany's Bild newspaper, calling it a "red line". Turkish President Recep Tayyip Erdogan said yesterday he expected parliament to approve the restoration of capital punishment after next month's referendum on controversial consitutional changes to expand his powers. Mr Juncker nevertheless said he was opposed to a complete halt to all membership negotiations with Turkey. "It makes no sense to try to calm (Erdogan's) nerves by stopping negotiations that are not even taking place." German Foreign Minister Sigmar Gabriel went even further, saying in an interview with Der Spiegel: "We are farther away than ever from Turkey's accession to the EU." Turkey abolished the death penalty in 2004 and the European Union has repeatedly made clear that any move to restore it would scupper its membership bid. However Turkish ministers say they need to respond to popular demand for the return of capital punishment to deal with the ringleaders of an attempted coup in July. "What Hans and George say is not important for me," Mr Erdogan said. What the people say, what the law says, that's what is important for us." Turkey and Europe are locked in a diplomatic crisis after Germany and the Netherlands blocked Turkish ministers from campaigning for a 'yes' vote in the 16 April referendum, which opponents fear will create one-man rule. In response, Turkish Interior Minister Suleyman Soylu threatened to "blow the mind" of Europe by sending 15,000 refugees a month to EU territory, which would endanger a year-old migrant deal between Turkey and the EU to reduce the flow of migrants. 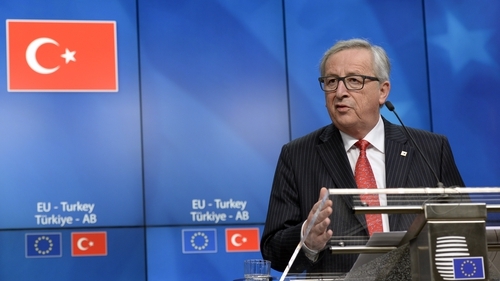 "Turkey will not back out of the accord, even if Erdogan has told me several times he wanted to," Mr Juncker said. Turkey has no interest in ceding "control" of its borders to "human traffickers and criminals".